Saturday, 22 June, 2013. The moon is at its closest to Earth, and at its fullest phase, making it bigger and brighter than usual. I set out with a friend to Eastern Neck Island National Wildlife Refuge. I paddle, she hikes (although she does try kayaking in a quiet cove). 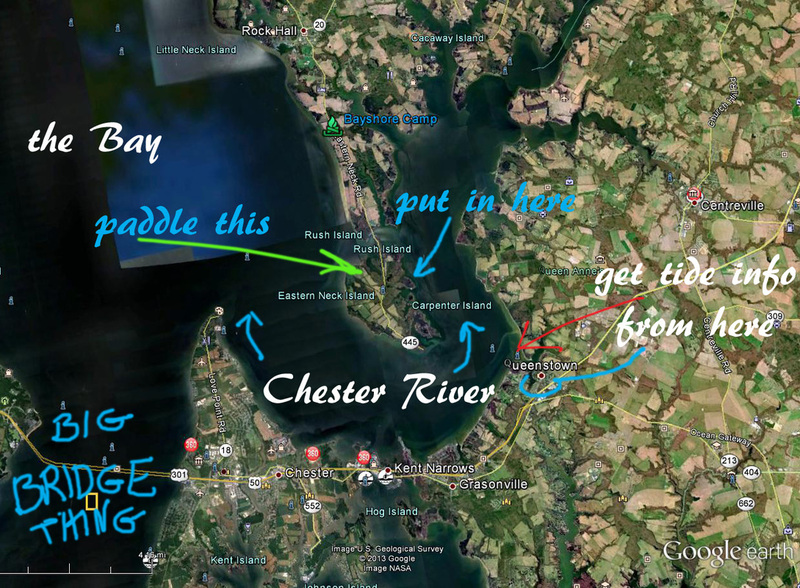 I head south from Bogle's Wharf to the tip of the island, where the Chester River wraps around it before releasing the west side of the island to the waves of the Chesapeake Bay. We are a third of the way down the Bay, in water about one third as salty (10ppt, varying by season and rainfall) as the ocean at the mouth of the Bay (30 ppt). Here are marshes, oysters, crabs, rockfish. Osprey tend chicks on nests, eagles catch fish and carry them off in their talons. I hear red winged blackbirds singing from the reeds and bushes of the marsh. A cormorant flies by. I find a turtle nest unearthed by a fox or raccoon. I've seen a blacksnake stretched across half the road, a fawn vanishing into the shrubbery, a fox furtively eating at the roadside roadkill diner (a fish dropped by an osprey). The trip south is about an hour, into wind and tide. As I round each headland, the wind and waves increase. 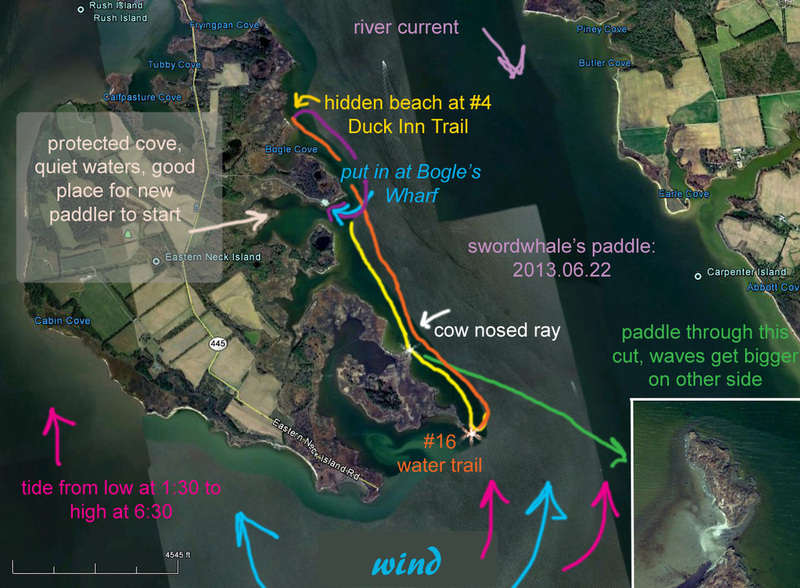 I get to #16 on the water trail, the halfway point from Bogle's Wharf's put-in. Here I have to decide whether to circumnavigate the island (4 or 5 hours, and it is already late), or turn back to Bogle's. I go north, back to Bogle's Wharf. On the way, I spot the surfacing fins of a cownosed ray, but there are no more to catch with the camera. I surf north with the wind pushing me, the waves rolling under me, their energy with me now. I am a Surf Jedi, and the Natural Forces are in my favor. The trip north takes 45 minutes or so, less than the haul south. 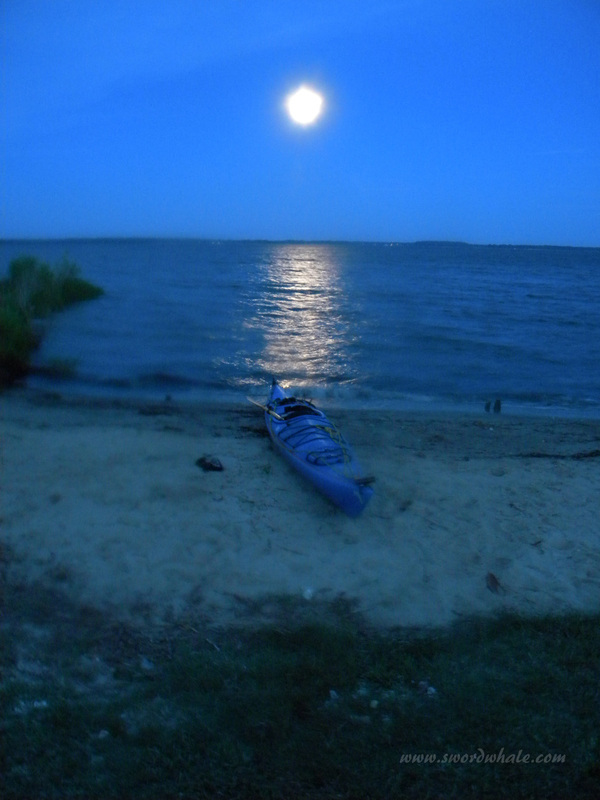 I pass the put-in and go north to #4 on the water trail, a tiny mooncurve of beach, nearly hidden in the glare of the lowering sun, the end of Duck Inn Trail. It is accessible from a parking lot by land, but more interesting from the "sea", the edge of the wide mouth of the Chester River. Far out on the river, sailboats make white shapes against the darkening shoreline. Shadows fall over the beach from the scattered trees. Great trees lie as driftwood on this tiny shore, oyster shells form a wrack line and mix with the sand, then the marsh grass. At the water's edge the beach becomes a treasure chest of Chesapeake Bay cobbles, small round river worn rocks in a plethora of colors and textures. I swim, I photograph, I collect my own treasure and stuff it in the 'yak to grace baskets or fishbowls of memories at home.